Fuel cells are considered to be all-round talents. That is why their use in the maritime sector is being continuously tested out. Until now, however, a successful breakthrough is yet to have occurred in this field. Nonetheless, as before, a variety of companies are trying to gain a foothold in this challenging area of potential application with their systems. The company Siqens GmbH is currently testing its high temperature methanol fuel cell (HT-MFC) on board a sailing vessel, while sunfire would like to put its solid oxide fuel cell, which has thus far only been used on land, to use on water as well. Siqens is still a young company. It was founded in 2012 and has set itself the goal of being able to offer market-ready fuel cell systems from 2017 onwards. The key focus of its work right now is on the Ecoport 800 energy converter, a methanol-based fuel cell which delivers an output of 800 W for 48 hours with 20 liters of fuel. The system has been designed together with the Danish membranes manufacturer Danish Power Systems (DPS) for a wide variety of possible applications – from weather-independent APU systems in mobile homes, sailing boats and vacation chalets, to range extenders, through to independent power supply systems that are used in industry. For further development and market introduction in the scope of a two-year project Siquens has received 2.3 million Euros in financial support from the EU. At the Sail 2015 trade show in August, together with ttz Bremerhaven, Siqens presented a sailing vessel, the MHD Marleen, on which a pre-series model has been installed along with a battery as a buffer storage unit. The vessel’s owner, Hermann Behrens, told H2-international that in the future, his goal is to not only be able to use undiluted methanol for the fuel cell, but for the combustion engine as well. Behrens reported that the supply lines are now available and the diesel engine is also suitable for methanol. He is also working on the replenishment of the fuel at the same time. In this respect, he explains that he favors methanol filling stations such as those that now exist in China, because supply on this basis is far cheaper than refueling with methanol canisters. He has already discussed this topic with ship owners and yacht owners. Behrens is confident that both the further conversion of his boat and the approaching discussions will proceed positively, so that the technology which is used can eventually go into use in HGVs, for instance. Since, as he explains, the use of fuel cells in shipping is “the toughest of applications,” other areas could also benefit from this development at a later day. sunfire, in comparison, is setting sail with systems that offer a considerably higher performance. As planned, in August the Dresden-based company delivered one of its SOFC units to ThyssenKrupp Marine Systems. 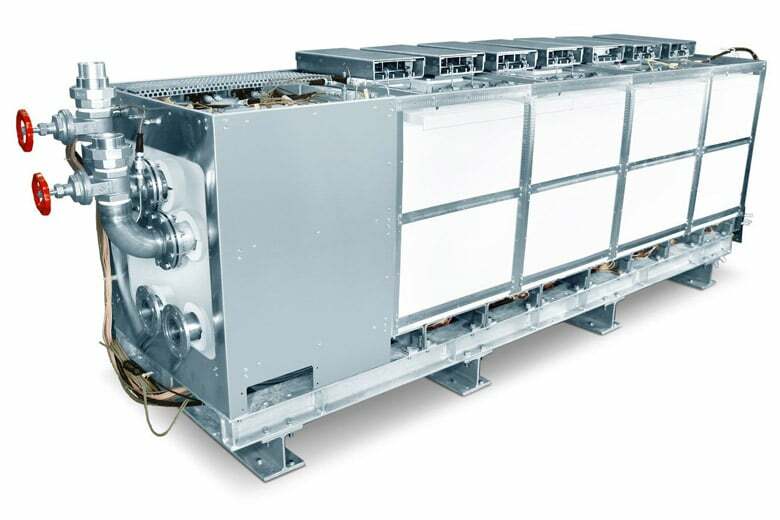 In the scope of the SchiffsIntegration BrennstoffZelle (Ship Integration Fuel Cells / SchIBZ) project, the high temperature fuel cell model, which now boasts 50 kW rather than the originally intended 40kW, will initially be used on land as part of the pioneering NIP e4ships project, before being tested at sea in 2016 on the freight vessel MS Forester owned by shipping firm Braren. Here, it will be responsible for 25 to 50 percent of the on-board power supply. Low sulfur diesel is to be used as the fuel.